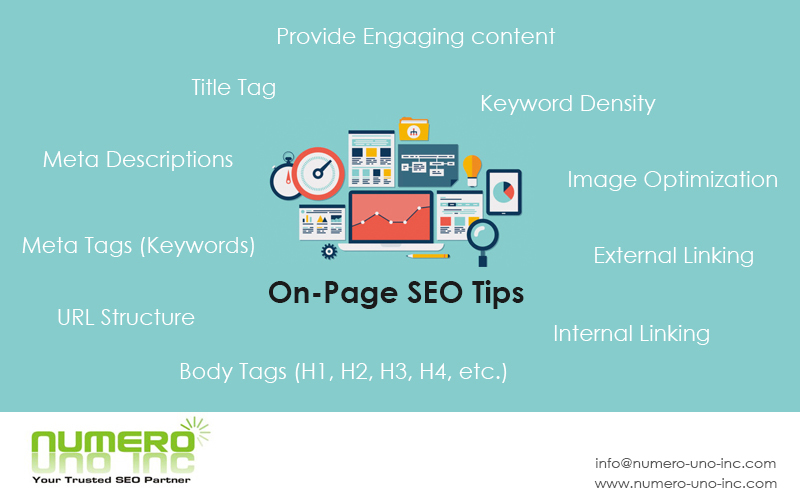 Discover On-page SEO tips which is an essential process which you can use, not only for accomplishing better rankings but also for running effective and successful internet marketing campaigns. If your website is not optimized properly your chances of success are decreased. Search Engine Optimization or SEO in a gist, is a term that summarizes everything you need to do to improve your website’s ranking position in the several search engines. This consist of configuration settings you can apply to your website (that’s on page SEO) and techniques you can utilize outside the limitations of the website (that’s off page SEO). On-page SEO is the process of optimizing all the web pages of your site in order to rank higher in the Search Engine Results Pages (SERPS). On-Page SEO deals with both technical SEO (titles, descriptions, urls etc.) as well as the content of your web pages. Your vital goal with on-page SEO is to communicate the ‘search engines language’ and help crawlers understand the context and meaning of your pages. On-page SEO tips are really beneficial when followed very well. Off-page SEO refers to link building plus other signals you can provide to search engines to assure them about the quality and effectiveness of your website. When we do SEO-optimization of a web page or post, we abide by several set of proven methods in order to rank it higher on a search engine. On-page SEO tips will help you in great lenghts. Nowadays, Google doesn’t only consider on-page SEO score when ranking a web page or article, but It also takes into consideration various other factors like social media signals (shares, likes, tweets, follows, etc.) domain authority, backlinks and countless other off-page metrics. Our main motive with on-page SEO is to optimize a webpage or an article in a natural, but smart way, so that search engines can effortlessly pick out the target keyword and get our website targeted visitors. Ensure that your website is responsive and broken links are kept to a minimum. Provide engaging and relevant content. Titles of your webpages or articles are one of the most crucial SEO factors on your site. You’re every page & posts should have its own unique title that contains the main keywords for that page. For instance, you can publish an article regarding a new strawberry milkshake recipe that you have tried. It is therefore extremely significant that you include ‘Strawberry Milkshake Recipe’ within your post title, perhaps “Easy Strawberry Milkshake Recipe” or “Strawberry Milkshake Recipe for kids”, etc. This way, whenever someone searches for Strawberry Milkshake Recipes in a search engine, your post has a better chance of showing up because you have included those keywords. Length of the Title Tag should be between 65-70 characters, including spaces. A lot of people overlook to include Meta descriptions for their pages. These descriptions are extremely essential place to include relevant keywords for your content, because they are utilized within the search results when your page is listed. For example, if we continue to use the ‘Strawberry Milkshake Recipe’ example, then a great Meta description intended for that page would contain those keywords and related ones. So, “This easy Strawberry Milkshake recipe is probably the most delicious, mouth-watering, tasty milkshake ever made.” Would most probably be a great Meta description to use, as it is relatively short, and at the same time containing a number of specific keywords. Length of Meta Descriptions tag should be between 150 & 160 characters, including spaces. You can include a set of keywords in the form of Meta tags in all your webpages. Make sure that you include the relevant keywords of your content, which you must have researched previously. It is very vital to ensure that your URL is shown correctly because it is an essential on-page metric. Your URL is the place where you can once again utilize your target keyword. Don’t use special characters, symbols, brackets, commas, etc. in the actual URL. You can make use of dashes to separate the words in your URL structure. TIP: Don’t use more than 5 words in URL. Your content should be broken down into smaller sections & paragraphs so that it is convenient for the people to read and understand it easily. You can add different headings to these sections, which are where H1, H2, H3, H4, etc. tags, are utilized. Most probably H1 tags are kept for your main page title, with following headings (just like the ones I have used throughout this post) being issued H2, H3, etc. These heading are used by the Search engines to determine what is significant within your content. This is why keyword rich headlines are more beneficial than generic ones. Ensure you write keyword rich headings in the sequence of priority in H1, H2 and H3 title tags. They are used by various crawlers to distinguish important content. It is a common myth followed by people that the only links that count are those from other websites. Even though these links are vital, these are not the only important links! Inserting links to your other website pages is an awesome technique of improving your site. When utilized properly, internal links can be a valuable weapon in your SEO process. Plus it also makes sure that your site gets accurately crawled permitting the search engines to find all of your pages. It also benefits to construct the relevancy of a page to relevant keywords and phrases. Besides from linking to your own web pages or blog posts, it is a valuable idea to link out to external websites as well. Mainly remember to only do this if the information on the external website is relevant to the information in your page or post. When you link out to external websites, you should be well aware to link to most trusted websites only. If you are not sure regarding the authority or popularity of a website, you can make use of no-follow tag in order to avoid passing your link juice to potentially bad sites. Similarly you must use do-follow links for reliable websites and no-follow links for those that are less trustworthy. Keep in mind that authoritative sites such as Wikipedia, or CNN, or a major player in your niche, will not only be trustworthy, but also they most probably have relevant information that your readers will adore. This will make your site seem more trustworthy and reliable. Image optimization does benefits a lot in navigating traffic from image searches. Keywords used in the “image title” and the “alt text” benefits to make your content more focused and targeted. And the more engaged a user is, the more likely they’ll stay around, therefore growing your overall rank. Check out this article Image Optimization Tips in which you will get detailed steps to rank images on search engines. Having the most appropriate and relevant keywords all the way through your content is very vital. Because it helps search engines understand what your content is about. Nevertheless, try not to go overboard with keywords. Don’t excessively repeat and overuse keywords just for search engine robots. Search engines can ban your site for this purpose. In order to escape this, ensure that you keep your keyword density to roughly 2-5%. These On-page SEO tips are just some of the methods which you could try in order to improve your on-page SEO. Nonetheless when used together, they can benefit you to improve your site traffic. Plus they will construct the relevancy of internal pages to relevant and specific keyword phrases. So, it pays to devote some time applying these to improve your site! So try these techniques and please leave your comments below denoting how it worked for you all. Kindly read our other blog articles on SEO, Adwords, Social Media etc.. This entry was posted in On Page SEO, SEO and tagged on-page seo, seo. Bookmark the permalink. Its just like you examine my head! A person looks to be aware of so much about it, as you composed the book inside it or something.This is fantastic blog. A fantastic understand. Glad that you like the blog ! you make blogging look easy. The full glance of your site is magnificent, let alone the content material! Thanks for such great comments! for the reason that this this web page conations really good information too. Write more, thats all I have to say. You clearly know what youre talking about. Thanks for you valuable comments! Hi there to every single one, it’s in fact a pleasant for me to pay a visit this web site, it includes priceless Information. Excellent article. really worth reading. I like the way you have explained the title.